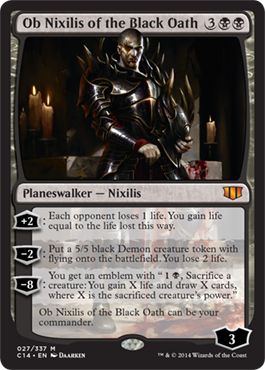 When we first met Ob Nixilis, he was a fearsome—but wingless—demon, a former Planeswalker who had somehow become trapped on Zendikar. The next time we saw him on a card, he had regained some portion of his former power when the hedron shard embedded in his head was removed. 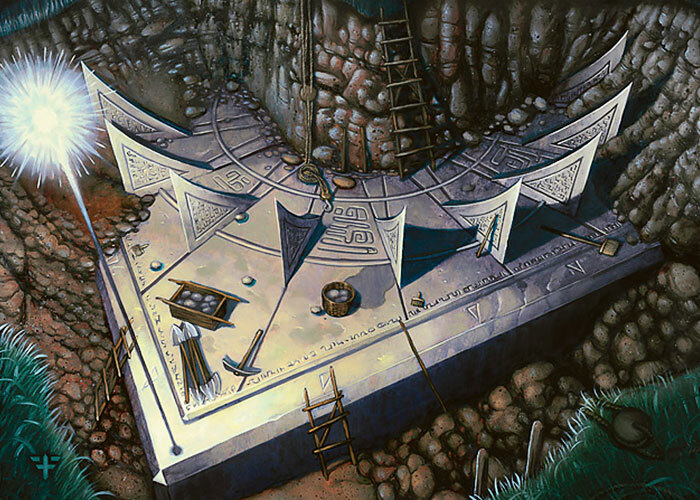 Despite that, he remains unable to leave Zendikar for the time being, as shown in the Uncharted Realms story "Dreams of the Damned." But that's Ob Nixilis's present. What about his past? The latest Commander release gives us a glimpse of what he looked like as a human Planeswalker, before he became a demon. To call the noise of battle a roar is to do it an injustice. It is a slight to the majesty of the sound. It is a symphony. The low, bass rumbling of siege engines, the pounding of trebuchet stones, silent in the sky, then crushing formations of men into scrap and paste. The clashing, soaring, screech of steel, men and beasts, monsters and worse, wave after wave of carnage. Rising above it all, the chorus. Shouts of triumph, of fear, of pain, of rage. Thousands of voices lent to a single cause. "My lord, our foes are preparing to retreat. Their flanks have collapsed. What are your orders?" My lieutenant bowed low. I couldn't help but notice, with no small amount of disappointment, just how clean his armor was. "Send two divisions into the canyon, cut off the escape." He flinched. "That will put two divisions of our most exhausted troops against their freshest. There will be heavy losses." "And yet, we will secure the supplies we need. Do you know where we are, Lieutenant? Look around you. What do you see?" He scanned the horizon. "I don't know, sir. A field. Stones. Some ruins." "Some ruins, indeed. The people that lived in this place were called the Keocian. Their empire lasted nearly three hundred years, before they brought about the Seventh Cataclysm. They were demon-callers; the best this world had ever seen. Artisans of magic and war. Their language was a direct predecessor of our own, you know, although we adopted our modern alphabet from the Liex. They had a word that meant 'victory at any cost.' Do you know what it was?" "Victory. The distinction is for lesser souls than ours." I gestured to my squire, who handed me my helm. I rode out to the front line to join the charge. When the work was done, I looked up at the soot-choked sky. The air was stale and foul, but it felt wondrous as it filled my lungs. Victory tasted sweet, no matter the circumstance. A scout returned, her armor stained with blood, some of it hers. "Two banners approaching from the northwest, my lord. The Velanti as well as the Raximar." I frowned. "The Velanti haven't sent word that they were going to be anywhere in the region in force. And the Raximar? How many, and how soon will they arrive?" "A full legion, cavalry, not equipped for siege. Between their cavalry and the Velanti, we're penned in." "We are betrayed, then. Interesting." The look of panic on the scout's face made me smile. "We made a move, and Lord Raximar made a better one. I half expected the Velanti to sell us out, but I didn't expect them to pick such an excellent time to do so." "Nothing. If Raximar is willing to negotiate, we talk. If not, we die." Lord Raximar's war tent was a demonstration of everything I hated about the man. It was a mobile court, huge and opulent. Hanging on the walls were tapestries showing accounts of his military conquests. They were factual enough, as Raximar wasn't prone to exaggeration, but the artistry was poor. Why bother to commemorate a moment if you're not willing to spend the time and effort to do it properly? Lord Raximar sat atop an actual throne, wearing his court armor. Plenty of lords did so, of course. Functional to a point, as no sane man or woman would meet another warrior unarmored. But it was a statement of how secure you felt in your home. An arrogant statement, more often than not. Raximar was an enormous man, bearded and smiling. "Ah, Lord Nixilis. A pleasure to see you again. My apologies for the circumstances." I had been ushered in to the room unarmed, but they didn't strip me of my armor. No small number of them would have died had they tried. I inclined my head. He went on. "My compliments on the condition of your forces. Most orderly in surrender. You've trained them well." "And my compliments on targeting the Velanti as a co-conspirator. Small enough to be coerced, close enough to my command to have valid intelligence, and they made quite the show of loyalty over the years—I never suspected their betrayal." "Earl Velanti still holds you responsible for the death of his son, you know. That's all this was about." I laughed. "I should hope he does! I expected the whelp to die, and he did. The boy was a terrible swordsman." Raximar frowned. "There are those of us who want something better than this, Lord Nixilis. Who want to unify these people. Bring an end to the fighting. Start to build again." "Spoken like a man who has never studied our history. Yes, there have been times of peace. Decades, even. But then we reveal our true natures again. The larger the alliance, the more brutal the collapse. And when the Cataclysm comes, and it always does, chaos comes with it. Ruin. I like my plan better." "To rule over graveyards and blood-soaked fields?!" "No matter. Your days of conquest are done. I will offer you submission, or we can conduct your execution in the morning." I muttered seven words under my breath. Raximar shook his head as both our ears popped. "What? I didn't hear that." I snapped my fingers, and one of Raximar's guards shuddered. 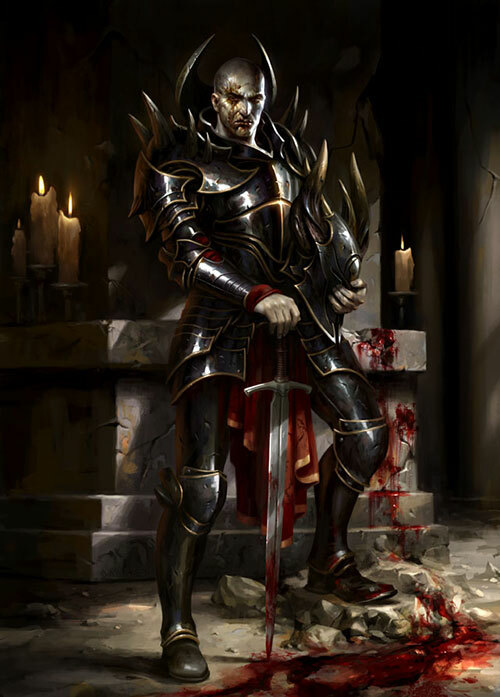 The guard took lurching, uneven steps over to me, drew his greatsword, and handed it to me. I snapped my fingers again, and the other six guards in the room all slumped, lifeless, to the floor. The wave of expended magic tasted like hot tar in the back of my throat. 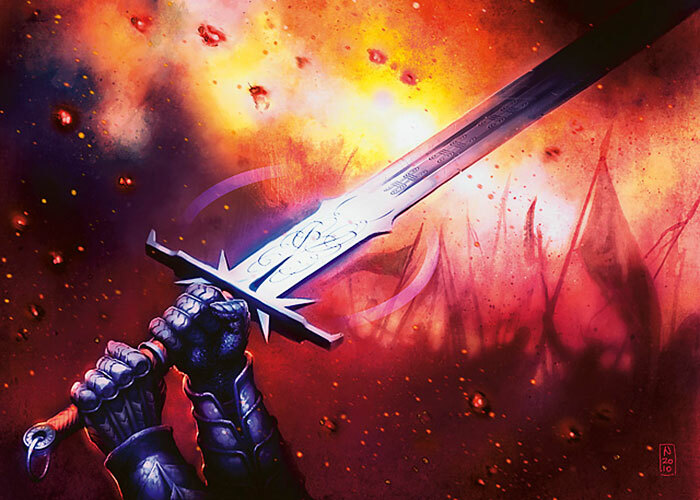 Raximar drew his sword and stood, taking a moment to find his bearings. "What is this? Guards!" I smiled. "No sound will escape this place for the next several minutes. And your closest guard? I cursed them years ago. Up until this moment, I wasn't sure whether the enchantment would hold this long. Lucky me." Raximar looked around frantically, and said nothing. "Here's what's going to happen. You and I are going to engage in a rite of challenge, and then I'm going to take over your forces." He scoffed. "You've never given a moment's thought to the old codes! Rite of challenge? Ridiculous!" "You're right, of course. It's nonsense. But you have a reputation as an honorable man. It's the sort of stupid thing you'd do. And either way, I'm going to kill you and tell the rest of your men that that's what happened. So we might as well." Raximar slammed his helmet down over his bright red face. "You're a coward, Nixilis. If this is how you want to die, so be it." I stepped into a back stance and leveled the tip of my greatsword at him. The greatsword is an easily misunderstood weapon. A novice feels the heft and striking power of the weapon, and concludes that it rewards pure force. Nothing could be further from the truth. It is an indescribably complex tool, a lever and a thrusting wedge, and especially against a brute like Raximar, not a big metal club to be swung around as hard as you can. Raximar was bigger, faster, and younger. He could practically use his blade one-handed, and the sheer crushing force he could generate could shatter stone and bone alike. So I let him come to me. He opened with a series of huge, reaching, diagonal cuts, and I kept my distance, just at the edge of his reach. I kept my balance low, trying to avoid the need to actually parry one of his strikes. A hard parry is as good as getting hit. He took a giant lateral cut, and I stepped in to meet it. As the cut approached, I flipped the sword upward from beneath, redirecting the attack high over my head. It left me in position to deliver a crushing shot to Raximar's right hip; despite his armor, I knew I had damaged bone. He flinched hard, but to his credit, he stayed upright. But it was irrelevant. A wound like that limited his mobility, and against an opponent who was willing to fight patiently, that meant the fight was over. I wore him down over the next two minutes, delivering a glancing shot to his shoulder, then a swift cut to the left knee. He stumbled with a desperate strike, and I slammed my sword upward into his wrists, breaking both and sending the sword flying. Raximar dropped to his knees, barely able to hold his body off the floor. He was panting, desperate for air, desperate for a way out. I rammed the sword down on the back of his neck, and it was done. Things fell apart very quickly after that. The Raximar troops, for some reason, doubted my version of events. I fought my way back to my troops, but all of my men had stood down awaiting the outcome of my negotiations. Some of those loyal to me helped me break out of the Raximar camp, but it was clear we were going to be hunted down a second time, this time with less ceremony than the first. I fled into the hills and ruins. We fought a series of skirmishes as we retreated. Most of my troops chose to surrender rather than die. I'm impressed that any were fool enough to lay down their lives for me, in retrospect. We ran, and we ran, fewer and fewer, until at last, just three of us remained to hole up in a cave. It ran deep, and we could hear water. We sealed the entrance. This would be the end of us, but we could do it on our terms. "We should go down fighting," offered a captain who had stayed with me to the end. I couldn't remember her name, but this seemed the wrong time to bring that up. "They'll have to pay for my life in kind." The second man, a common soldier, sat and sobbed. "It doesn't matter. Dead is dead. And we're dead. We're dead." But my eyes were drawn to the cave walls. "Do these look like worked stone to you?" My companions didn't seem to hear me. But I was right. The cave floor had certainly been smoothed, and the walls were too even to be natural. I willed a small light into existence, and walked deeper into the darkness. It took me some time to clear a collapsed tunnel, but on the other side was a small chamber. I recognized it immediately from my research. It was a Keocian summoning chamber, and it was entirely intact. Without my reference materials, the inscriptions took some time to decipher, but the crux of it was simple enough. Two pedestals, each with a large obsidian bowl. 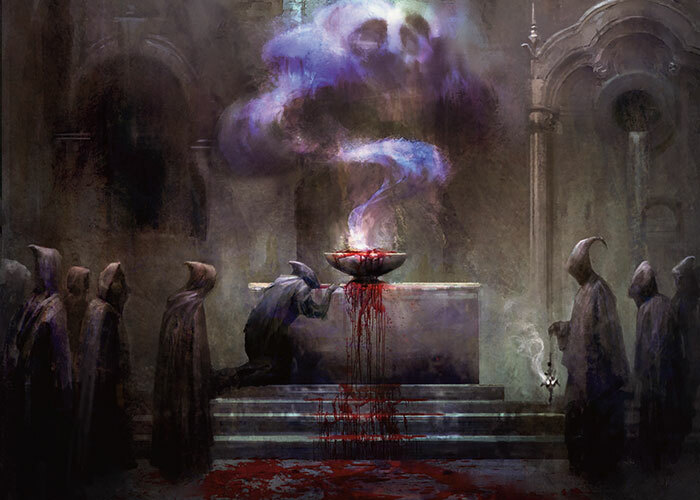 You fill each bowl with blood, and you place one hand in each. From there, the chamber would do the rest. And I just happened to have two lives with me to fill the bowls. My companions got their wishes. One got to die fighting. The other died a meaningless death. I filled the two stone bowls with their lifeblood, and when I was done, you couldn't tell which had been which. The rest of the ritual was laughably easy. Beings of power want to be called. They want to serve their purpose. I'm sure I made a mistake or two in pronunciation, but it didn't matter in the slightest. The doors that held back the beings I invoked were thin, and as I pulled them open, they pushed from the other side. A child could have done it. They wanted to come. I felt them in my mind. They searched it roughly for my desires. I tried to direct them, to focus them on the problem at hand, to clear away the forces that penned me in. But they knew better. They knew what I really wanted. They did as I asked. The process was completely mundane. No howling winds, no eruptions of fire and blood, no scouring of the land by ravenous winged things. It just ended. Every living soul just fell down and died. From those digging through the cave-in to reach me, to a farmer on a far-off continent. They simply died. All of them. I walked the scoured landscape for days to be sure. Encampments filled with rotting meat. Fortifications manned by corpses alone. On the tenth day, I noticed the creature shadowing me. That night, it joined me by my fire. He took on my form, down to the smallest detail, but his voice was like a void. "Congratulations, Lord Nixilis. You have done it. You brought peace to this world." "Peace. Yes, I suppose I have." "The Eighth and final Cataclysm. You played your part well." "Centuries of war. Possibly millennia. For this?" "Worlds are made and broken as toys for greater beings than us. We were made to deliver a prize and a price." I smiled. "Here sits Ob Nixilis, sole survivor of a world that only knew war, is that it? Very well. It's a better fate than the rest of them got." I pulled a flask of water from my pack. "Here's to me, then." I took a swig, and looked around. I was completely alone. The absurdity of it all washed over me like a wave. A lifetime of scrambling for power and control, when all the while I had been dancing on another's stage. All my ambition, all my desire, all my study and toil and pain. All of it for nothing. It was the end of the world. It was what I had always wanted. It was a trap set for me, thousands of years before my birth. I laughed until I choked. I fell to the ground, hands and knees, weeping and gasping. The end of the world. When I opened my eyes again, I looked upon a new world. It fell much more easily than the first.